Fresh off an announcment that they'll be revamping their popular news-sharing site, Digg on Wednesday went live with a new iPhone app. The free app is designed to give users a look at the most popular stories on the Web, as chosen by Digg's millions of monthly users. 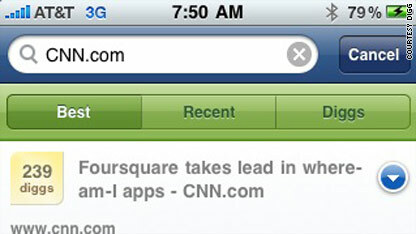 It lets users browse lists of recent content, rate stories, search for specific topics and save stories to read later. The app was available Wednesday afternoon in Apple's European store and was expected any time in the U.S., according to a Digg spokeswoman. Digg will be releasing a similar app for the Android platform soon and plans updates to the iPhone version based on user feedback, said the spokeswoman. At the South by Southwest Interactive festival earlier this month, Digg CEO Jay Adelson announced an invitation-only beta of a new version of the site which creators say will be faster, more personalized and allow anyone, not just Digg users, to suggest stories to the site. Founded in 2004, Digg and similar sites like Reddit [which already has an iPhone app] and Mixx have taken a hit as more people use sites like Facebook and Twitter to share links. But Adelson said Digg still has about 40 million monthly users. What do you think? Is Digg an app worth picking up? Conan O'Brien issued a statement Tuesday criticizing NBC's decision to move his show back to 12:05 a.m. ET. The move, which will free up the 11:35 time slot for a half hour of Jay Leno, is seen as a slap in the face to O'Brien who took the reins of "The Tonight Show" just seven months ago, and his fans are responding online. Earlier this week, O'Brien joked he may be performing "the show live every night from Zanies Comedy Club" where the audience would receive 1/2 price drinks if "you tell 'em "Coco" sent ya!" The sketch became a hit and spawned the Internet meme "I'm with Coco." 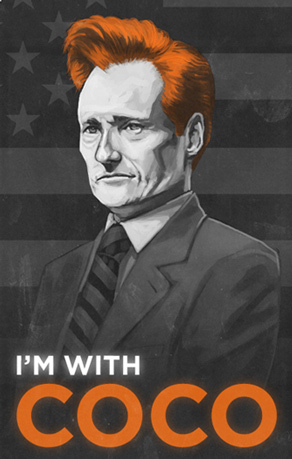 Pro-Conan artwork by Mike Mitchell is appearing on personal blogs and social news aggregators like Digg. #teamconan is topping Twitter's trending topics. 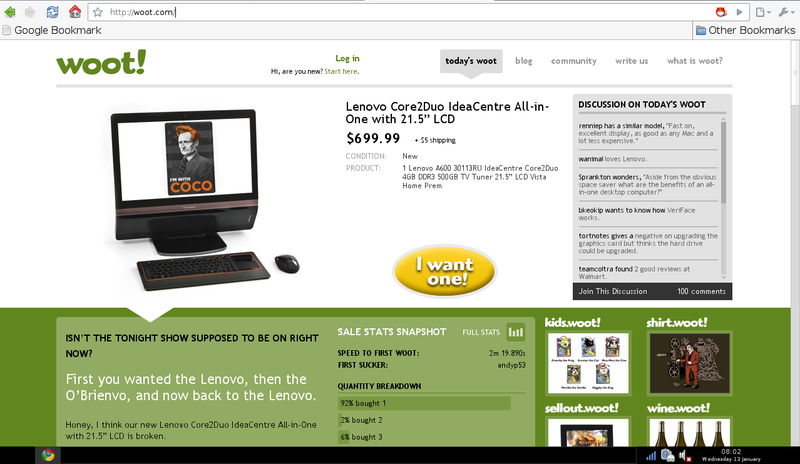 Woot.com has incorporated Conan's image into its ads. And the Reddit alien has been given Conan's signature gravity-defying haircut. O'Brien can probably thank his younger audience and their proficiency with social media for his vocal online support, but Jay Leno reached a larger audience when he hosted "The Tonight Show." Are you a die-hard Leno fan, or does NBC's decision to move "The Tonight Show" have you shouting "I'm with Coco!" Last night Internet Service Provider (ISP) AT&T began filtering portions of the controversial image board 4chan.org. AT&T broadband subscribers found they were unable to access the infamous /b/ and /r9k/ sections of the site. 4chan.org is a system of message boards primarily dedicated to anonymous discussion and image hosting. The site's popularity is largely due to minimal posting regulations that stimulate a freewheeling, Wild West atmosphere. Flood the callcenters and inboxes of AT&T. Make them confirm that img.4chan.org (make sure its img.4chan.org and not just 4chan.org) is down. Then make the honest threat of service cancellation if this censorship isn't undone. The objective of this little operation is to basically make sure that this precedent is not set. Make it absolutely abundantly clear that this [Internet censorship] is NOT acceptable to American consumers and this WILL NOT be allowed to happen, or else face financial and political suicide. Anonymous posters also began to spread rumors claiming AT&T CEO Randall Stephenson was found dead outside his home and that AT&T had stopped carrying the iPhone in attempt to affect AT&T's stock price. Beginning Friday, an AT&T customer was impacted by a denial-of-service attack stemming from IP addresses connected to img.4chan.org. To prevent this attack from disrupting service for the impacted AT&T customer, and to prevent the attack from spreading to impact our other customers, AT&T temporarily blocked access to the IP addresses in question for our customers. This action was in no way related to the content at img.4chan.org; our focus was on protecting our customers from malicious traffic. Overnight Sunday, after we determined the denial-of-service threat no longer existed, AT&T removed the block on the IP addresses in question. We will continue to monitor for denial-of-service activity and any malicious traffic to protect our customers. For the past three weeks, 4chan has been under a constant DDoS attack. We were able to filter this specific type of attack in a fashion that was more or less transparent to the end user. Unfortunately, as an unintended consequence of the method used, some Internet users received errant traffic from one of our network switches. A handful happened to be AT&T customers. In response, AT&T filtered all traffic to and from our img.4chan.org IPs (which serve /b/ & /r9k/) for their entire network, instead of only the affected customers. In the end, this wasn't a sinister act of censorship, but rather a bit of a mistake and a poorly executed, disproportionate response on AT&T's part. Though the cries of censorship and claims AT&T violated net neutrality may have been misguided, AT&T should have informed its customers before blocking such a large and controversial Web site. I doubt that is a mistake they will make again. The Web is full of middlemen and aggregators. Google is the biggest. Digg once was the coolest. And now Twitter and URL-shortening services create (mostly) transparent bridges between Web content, like news stories, and online readers. People both love and hate these go-betweens. On one hand, sites like Digg, Facebook and Twitter give readers access to all kinds of news and social content they might not otherwise see. But small changes can make a benevolent middleman seem downright meddlesome. And that's what happened to Digg this week. The Web 2.0 rock-star site - which lets a community prioritize news stories by voting them up or down - is drawing fire from tech blogs for sticking itself between its links and the news stories it promotes. A confusing change to the site's service caused some shortened story links to redirect to Digg's pages, rather than to the original pages on blogs and news sites. Don't get bogged down in the details of the change. Part of the problem is that the change is confusing to everyone. TechCrunch writer Jason Kincaid calls the move "career suicide" for a Digg toolbar and "incredibly irritating" to users. On its blog, Digg says it backed off of the change somewhat, making it only apply to future news stories, not retroactively to all Digg-shortened links. But part of Digg's problem is that the site is overly responsive to criticism in a way that obscures its vision of the future, writes Josh Lowensohn of CNET, a CNN.com content partner. Right now, sites like bit.ly and snurl.com take Web links and shorten them so they'll fit in Twitter posts or e-mails without taking up too much space. 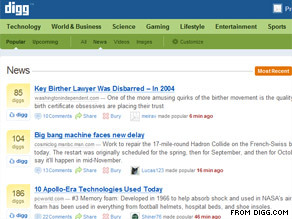 Click on one (this for example: http://bit.ly/iqfI) and you go straight to the original site. These services may outcompete Digg's linking service because of their simplicity and reliability, writes Michael Arrington of TechCrunch. But there also could be a future in which all links must pass through a middleman site, thus slowing down search for online news and entertainment down.